Jungle Red Writers: Will E-Books take over the World? Will E-Books take over the World? When my new book, Heirs and Graces, came out two weeks ago I was surprised to find that it topped the historical mystery bestseller list in its Audible audio format. More people were listening to it than reading it. This also coincided with my reading an article that claimed e-books were not growing nearly as rapidly as predicted. It seemed that the techies of the world had bought their Kindles, Nooks and Kobos when the devices first came out, but the general reading public was not following suit. What's more those original buyers had loaded their devices with lots of cheap and appealing books that were still waiting to be read, thus not encouraging their owners to buy more. Real books were not about to lie down and play dead. So I decided to run a poll on my Facebook page. What surprised me was that 20,000 people came to visit. I have never seen numbers like that before, especially in the space of two days. And as I read the comments one thing became clear People are passionate about their reading habits. Many people finished their post with one or more exclamation points. "Only real books!!!!" So having read and digested 1000 comments I can tell you, with scientific accuracy :) , that real books beat out electronic versions by more than two to one. And something interesting emerged from this study: reading from a real book was a sensory experience, involving all five senses. 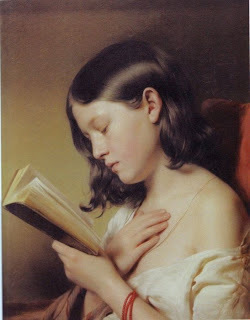 There was the tactile stimulation of turning pages, feeling a book in one's hand. As one commenter put it, "If it's a mystery I can prolong the suspense by holding the tip of the page between my fingers and waiting in delicious anticipation before I turn it." Another commenter said that seeing her books on a shelf evoked feelings of pride of ownership and pleasurable memories of past reading.Then there is smell of books, particularly old ones. The book was perceived as part of a pleasurable experience. As one commenter said, "Nothing like a hard cover on an afternoon with a nice breeze." Someone else said, "How would you press flowers in an e-book?" Those who chose e-books liked the convenience, especially for travel, plus the fact that downloads were cheaper. Some commented they had run out of shelf space. Others that they could download out of print books. One commenter admitted she was naturally lazy and it was so easy to have a book delivered to her Kindle with one click. In the case of audio it also seemed to be convenience and the only way to fit books into a busy lifestyle. One commenter said "If it weren't for audio I wouldn't have a chance to experience books." Audio has the added advantage that one can do something else at the same time. Audiophiles listened during long commutes, during workouts, housework or dog walking. One of my fans told me last week that her dog walks have stretched to three hours while she listened to my new book. Two surprising comments came out of my survey. A teacher mentioned that children tired of looking at screens all day and liked real books in their free time, (who knew?) and someone who worked in a college bookstore stated that most college students preferred real books, but that downloads of textbooks were so much cheaper and easier to carry around. About ten percent of the respondents said that they loved all forms of reading. "E-books, audio, cornflake packets" one woman said. But it is reassuringly clear that real paper books are not going away any time soon! Bookstores--you may breathe a sigh of relief. So what about you, Reds and Readers, do you still read predominantly electronic books, listen to them or insist on the good old paper versions where you get the added bonus of a workout by turning the pages? I have an eReader [which I love, especially when I travel] and I have to agree with all the points your survey participants made and one more that is particularly relevant for many readers: my eReader allows me to adjust the size of the print so that I can easily read the book. And audio books certainly do help to pass those excruciatingly-long driving miles. But the truth is that, in the end, none of that makes me want to have only eBooks . . . I'd prefer to see those books on my overflowing bookshelves, I want to hold them in my hands. For all the reasons your survey participants mentioned, I want real books. And, on all those book tours and at those book signings, it’s only the real books that get signed by their authors . . . . I agree with everything. From the running out f space for print books to the listening to audiobooks while I knit. I read an e-book when I go to bed because I can adjust the light so it doesn't bother my husband. And I treasure my author-signed bound books. I loved the cornflakes box comment. When I was little my mother says I would read anything - especially when I was supposed to be cleaning my room. Does the medium affect the author's royalty? I love using an eReader and the vast majority of books I read are in electronic format. I am a fast reader (four hours for the average book) and it's so nice to know there's another book ready for me if I finish one in the middle of the day. It's much easier to read and eat, say, a fish taco (yesterday's lunch) with an e-reader propped up on my sunglasses, bumping the screen with my pinkie knuckle so I don't leave too many marks. For a long time after I got my Kindle, I only read the free stuff. There's a lot out there, from classics to promotional sales of well written books to really poor quality stuff. 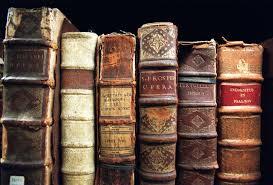 Eventually I tired of the crapshoot of free books and started buying inexpensive books - usually promotional sales. I discovered authors I liked because one or more books were available for a couple of dollars for a few days. If I really enjoyed them, I kept buying. In the past few weeks, I just powered through Louise Penny's Inspector Gamache books, downloading the next immediately after finishing one. While I respect and admire the authors who create the stories and don't want to reduce what you receive, I admit I am frustrated when I see a publisher set the ebook price the same as the least expensive binding available - or sometimes more! If they don't have to pay for printing, shipping, distribution, etc., neither should I. The two biggest problems I see with ebooks are that I usually can't loan them when I'm finished, and I fear that at some point my books will no longer be available to me, either because of changes in technology or a glitch in a system somewhere. Still, I don't see myself switching back to books. The convenience far outweighs the sensory experience. I would even suggest that many of the people in your survey who swear they will only read physical books either struggled with the technology on their first experience or have never used an ereader and are objecting purely on principle. I prefer real books, but needs have required that I do much more of my reading via e-book. #2 I really am running out of space for books. I could easily open my own library tomorrow AND still not have an empty shelf. I do love the "concept" of being about to change font size, but how often do I really use that feature? Not very. I love to be able to take multiple books with me on a trip, without adding to the luggage weight, so e-books come in handy. But above all of that, I really cherish my signed copies of books and I just can't do that (effectively) with an e-book. As for audio, I really don't do that much except maybe on a long road trip. My mind tends to wander too much when listening. I prefer music to pass that time. In the end, the content is really more important to me that the method of delivery, but each format has a place and a purpose. And I think they will all begin to live in harmony soon. Interesting post and fun survey, Rhys! One of those fun little quotes I've seen recently - "Books are no more threatened by Kindle than stairs by elevators." I love both. I don't buy as many old fashioned book books as I used to. Space is a factor. I do buy old fashioned book-books written by favorite authors that I know I'll want to keep. I buy ebook versions of books by "new to me" authors that I've heard or read about and that stir my interest. I have two twenty something nieces who are big readers, but only read Ebooks. My mother and my mother-in-law only read "real" books. I'm not a fan of audio - I find my mind wandering and realize I've missed a lot. I read mostly e-books because of the space issue and the physical ease of reading. I wish they were around when I was reading those bookstop Harry Potters. The price isn't a strong factor for me. I'm a relentless recycler of books so I like knowing that after I'm done reading an e-book, I don't have to worry about its fate. But I still buy paper books by authors I love and will reread, for books that close friends and family will want to read, and on a whim. And I love listening to audio books on train commutes and as a bribe. I'm willing to do very boring things (laundry, cleaning, chopping tons of onions) if I can listen to a book at the same time. I read both these days -- while nothing will replace the feel of a "real" book and I love having my bookshelves lined with my favorite books, when I'm traveling I love having the Kindle. With my graphic designer hat, I've been reading studies that show people have "screen fatigue" and assign greater authoritative value to printed materials. For designers, that means not abandoning print newsletters, since email is the new junk mail. I'm one of those people who ended up with over a hundred books on their Kindle off the bat and then realized that my amount of reading time hasn't increased so most of them just sit there. I tend to read favorite authors in paper and try out new authors in e-format. I also use the Kindle for travel, except for the flight, since I hate not having something to read even for the short time they make you turn it off during take-off and landing. All of this applies to fiction. For non-fiction I greatly prefer paper. I just don't find the e-books as easy to move around in and if there are pictures, graphs and such a paper book is far superior. Marianne, you asked whether the different formats affect an author's royalty. Good question. I find I still sell about the same number of hardcovers--maybe the curve goes up a little--but more e-books and especially audio books. It depends how much they decide to discount what we get for e-books. Slightly less than hardcovers. Audio books--depends if they are bought with credits or not. Overall about the same as the paperback BUT they are all extra to the original contract, so all good. Gigi, that's interesting. "Email is the new junk mail." So true. Hit delete. But if I get something interesting looking in the mail, I'll read it. And having almost finished The Great Book Project of cleaning out all my bookshelves, I'm very conscious of space. With all my bookshelves reorganized, and having given away or sold several hundred books, some shelves are still double-stacked. I'm going to have to adopt the one-in/one-out rule, or I'll end up in the same mess again. I do LOVE hardcover books. The dust jacket design, the interior design, the typeface, the feel of the pages... And there are authors, many of them friends, I'll continue to collect. I think there is room for balance. And I always think of the utter panic in the movie theater industry when films began to come out on video. "No one will ever come to a theater again!!!!" It turned out that while people love the convenience (and the price) of watching movies at home, nothing beats the big-screen experience. Rhys, I'm with the majority of your survey responders. Nothing replaces the physical book for me. I don't have an e-reader, but I do read e-books on my laptop with Kindle for PC. (I first installed it so I could download Hank's Prime Time, in fact, and start reading all her books.) But I spend so much time on the computer that I don't want to read books on it that much. My son loves his Nook, especially for traveling, and I can see where it would be a great blessing. I suspect I will have to go that route eventually because books are taking over my house, quite literally. I need to do what Debs has done and then institute the one in, one out rule, and make use of my library more. But I'll never give up the physical book. I suspect I'll eventually work out something where I'm reading many books on an e-reader and buying and reading many others in paper form. What would I decorate with if there were no printed books? One of my favorite quotes is from Anna Quindlen and states, "I would be the most content if my children grew up to be the kind of people who think decorating consists mostly of building enough bookshelves." I get deep satisfaction from seeing my grown children with actual books in their hands. And, although I have lots of book shelving in my house, there's nothing wrong with using baskets and book stacks to accommodate the overflow. Another quote that I've seen of late compares the dearth of danger that printed books will be replaced by e-books to stairs being replaced by elevators. Rhys mentioned the tactile part of book owning, and for me, this aspect is the most important reason to prefer print. Holding the book in my hands and turning each page produces a profound joy and satisfaction. I, also, immensely enjoy book covers, although I don't judge a book by its cover. And, book signings were mentioned. I treasure my signed books and have selected shelving for those cherished tomes. I do admit to owning a Kindle, but it was a gift, and I use it sparingly. I don't discount its convenience, but I don't read for convenience. My last words on the subject are that too many aficionados of the print exist to fear the demise of "real books." I agree with Kristopher that the content is more important than the format. I hope all the various formats all continue as they suit different aspects of the diverse buying public. Different strokes for different folks. I'm one of those people who read all formats. I have print books for the books that I want to share, or that I want to save, or that are particularly important for me in some way. I read e-books when I travel and download cheap series of old books when they come out. And then there's the audiobooks....good for trips in the car and to listen to while knitting. I have some books I will only listen to on audiobook because I love the readers so much. When Ereaders first started gaining some popularity (and I was one of those who lifted my nose high in the air while stating "Nevah!") I recall reading a blog Vicki Lane had written on the subject. She, or one of her commenters, mentioned how they could now stop worrying about taking all their favorite books with them if/when it came time to move into a nursing home because they would ALL easily go with her on her iPad. Honey. I so quickly downloaded so many of the books I know I could not live without it wasn't even funny! I say this in jest (kinda), but truly, the thought of being able to still have well-loved books with me in an environment that would otherwise make it possible is a comfort. Linda mentioned reading on her laptop using the Kindle app. I just simply can not read on a computer screen. I do that all day at my day job; it's not happening at night. The benefit of the dedicated e-readers over Ipad and laptop apps is the removal of the backlit screen. That is why the eye gets tired working on computers. That problem does not exist on the Kindle, Nook, etc. as long as one is using the reader versions and not the tablets. As the population ages, ebooks will have an appeal because you can adjust the font to your own needs. You can get them over WI FI if you lose the ability to drive. Same for audio books: Some of us will go blind with age but audio books will allow us to share in the joy of stories. In some ways I might prefer paper books but they do cost more. At the library the traditional books are often soiled with other people's boogers and other stains. No one can stain my kindle version. I have a both a Nook and a Kindle Paperwhite Touch (for use in the sunlight). I buy the traditional books that I want to own and use my e-readers for those books that I just want to read and will not care to revisit. Before e-readers, these are the books I would read and pass on to a friend or donate to a community book sale Books with illustrations, poetry, literature, series that I'm particularly fond of are among the books that I buy in traditional form. I also buy used books, two such recent purchases are "The Letters of Virginia Woolf," "The Oxford Book of Ireland" and a collection of Victorian Ghost Stories; I can't imagine wanting to read any of those on an e-reader. Last week I was on vacation at home. I did a lot of reading. By the end of the week I had a very sore left wrist, numbness in the fingers on the left hand, pain in the back of my neck and down my arms. The majority of my reading was done with print books. So, do I like the "feel" of a "real" book in my hands? Nope. I DO still buy print books written by my favorite authors, though, and will continue to do so, but I just can't do "marathon reading" with print books. Nowadays, if I purchase a print book by an author, it means I really like that author! If I want to own a non-fiction book and have the choice of print or e-book, I choose the e-book. It just works out better for me that way. I try out authors who are new to me by taking advantage of Kindle sales. If I really like them, I buy print versions of future books by them. Many of the books on my Kindle are out of print, and I was delighted to be able to purchase ANY version of them. I laugh when I read that lots of people have hundreds of e-books that they haven't read, or have read only once. I have about 200 e-books, have read lots of them at one time or another and consider the balance to be on my TBR list. I have hundreds of print books I've read only once or not at all, but I KNOW I will get to them someday, although I may need to limit my time on them to avoid pain/injury! Another reason I like e-books is that I have a very tiny home with limited space for bookcases. Books are strewn all over the place, on nearly every surface and there are more in boxes in the basement. I'd pile them up on the floor, except that clumsy me would trip over them. An e-reader is a godsend for keeping things (a little) less cluttered, as well as keeping the reading experience painless. I LOVE taking the Kindle if I go away on vacation because it means I don't need a separate bag for books. I've typically read half a dozen or more books on vacation, a heavy load if they are all print books. 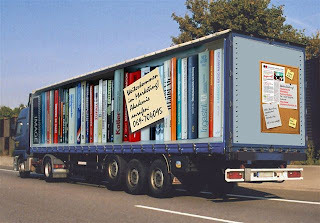 Print book, e-books, audio books are all packages that contain content of value to the reader. It's great that people have so many choices. At this point I have not tried audio books but the day may come when that will be the easiest way for me to "read". I hope that all three choices remain available, and I'm sure that more choices will become available through newer technology. I am on my third Nook, this is the HD version, and in fact I'm reading this blog and typing this response on it now. We spend a couple days a week at a second home in rural Kentucky, where I prefer not to lug a laptop. My husband drags his, but he usually is working on it here, so if I want to keep up with the rest of my world I need my own device. The Nook is perfect; I can read one book after another (no TV here, either), read e-mail, check social networks, and surf the Web. With a device that fits in a handbag. I just wish I'd had one when I went to South America for two weeks, and ran out of reading material ten days in. That won't happen when we go to Tanzania this fall. Like Deb, I can only hold a physical book for so long before my hands start bothering me, and my mother is the same way. We both appreciate the type resizing and the background light and color adjustment features. I probably read two e-books to every paper one, maybe more. My new smartphone came with a Kindle app. It is very handy when the doctor or hairdresser takes too long to call my name. I was surprised to see how easily I adjusted to reading on that small screen. And audio books are wonderful for car trips, but mostly solo ones. It is not easy to find one to satisfy multiple occupants, in my experience. I love my Kindle for vacation! But it's just anther part of my reading arsenal, right? I didn't give up radio when I got a TV! And wow, when it comes to the back list--life-saving! I agree with Kathy Reel. "What would I decorate with if there were no printed books?" Our family wallpapered one of our bathrooms in book covers. Every book represented on the walls has been read by one or more of our family members. On a sad note, there will be no more Elizabeth Peters books for my daughters and me to revel in. There must be five or six of her books on those walls. But we now have Rhys Bowen, Deb Crombie, Jacqueline Winspear and Susan Elia Macneal. Life goes on and we will survive. Hank, that is a really good point, the backlist. So many great authors, but it's so frustrating to find a wonderful older series, but the first few books are no longer in print. Being able to find them in electronic form has been great, and gives new life to them, I think. IT'S THE JUNGLE RED ICE CREAM CRANK OFF! Must We Like the Characters?